Chateau Ladesvignes sits on a plateau high above the Dordogne Valley on the D7 road, the wine route between Pomport and Monbazillac and 10 to 15 minutes from the centre of Bergerac. 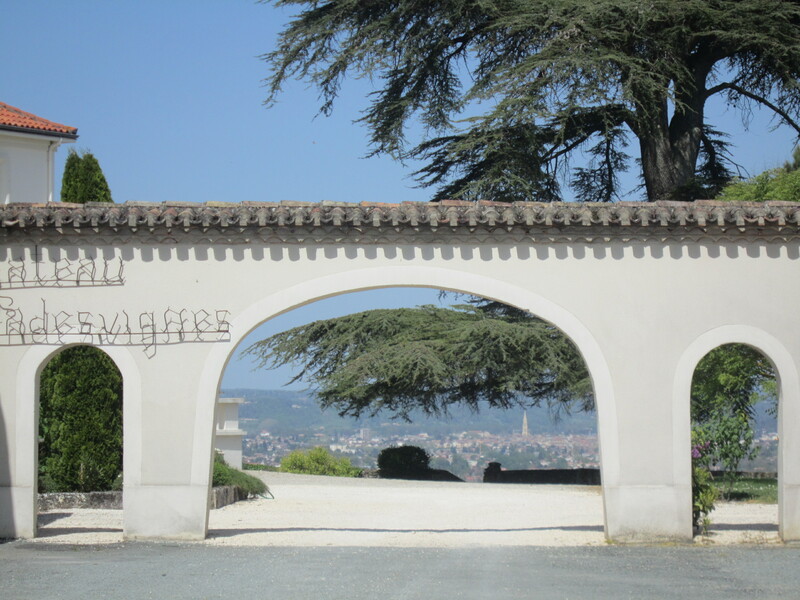 As we turn into the courtyard directly off the D7, the first thing we notice is the stone archway inscribed with the name Chateau Ladesvignes and the great cedar tree beyond. The tree is a natural magnet and we are soon standing beneath its outstretched limbs gazing at the panorama that unfolds beneath and beyond us of fields, farms, vines, cattle, hamlets, villages and the spires and rooftops of Bergerac. The tree stands above old fortified walls surrounding the property on one side and we discover that many of the winery buildings are probably 15th century; no one knows for sure. We linger a few minutes to take in the expansive view and breathe in the history of the place. We’re here to meet Véronique Monbouché, wife and co-proprietor with her husband Michel. Mme. Monbouché tells us she and her husband acquired 35 hectares in 1989 and subsequently took over other family vineyards to farm the 60 hectares that they cultivate today. Being fourth generation winemakers, they hope their two children will carry on the family tradition one day. Entering the wine tasting room, Mme. Monbouché guides us through a tasting of their wines. It’s a warm day and we particularly enjoy their everyday white Bergerac Blanc Sec. It is fresh, delicious, made mainly from Sauvignon Blanc grapes and is competitively priced. We enjoy the range of wines we taste and notice that many of them have won awards. I particularly appreciate their tri-fold brochure. 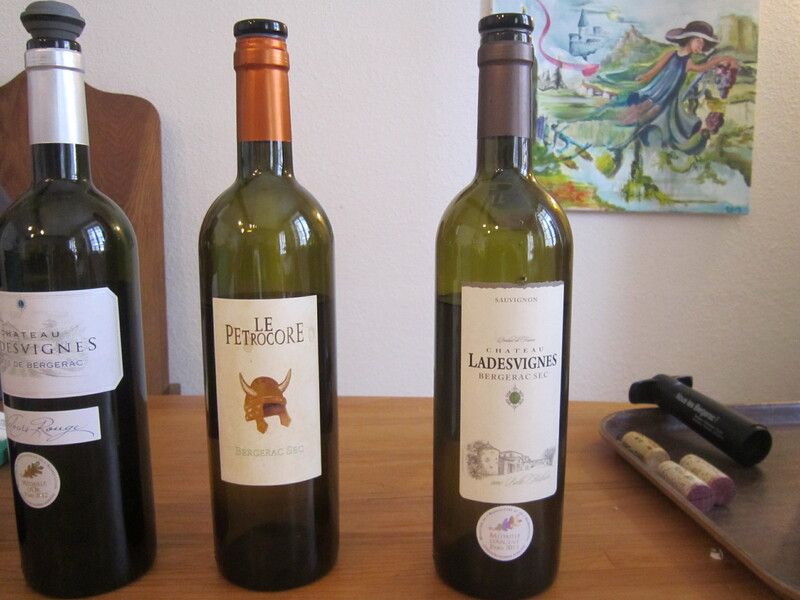 For each of their wines there is a photograph of a bottle of the wine with a brief tasting description. Also included are recommendations for serving temperatures and wine ageing, as well as the prices and ordering details. The medals and awards are noted. The information is practical, helpful and easy to read. It is a well designed marketing tool. We ask Mme. Monbouché about wine tourism at the Chateau and she disarmingly tells us that marketing is not their strong suit! Our impression is that the wine sells itself through quality and value. 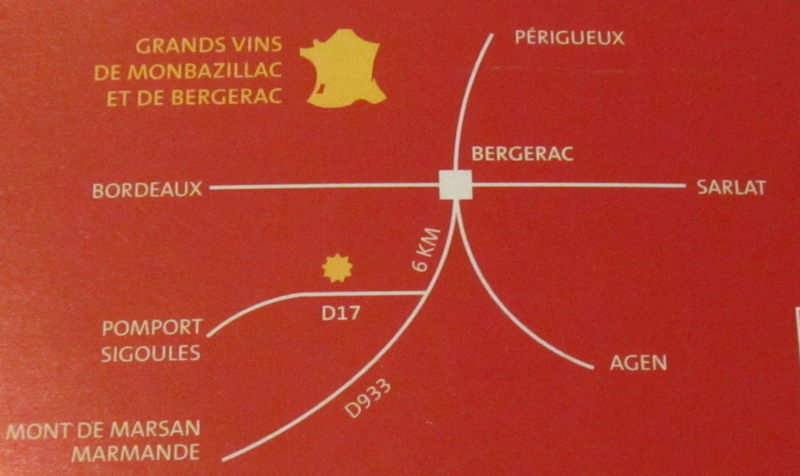 Véronique Monbouché explains that the main market for their wines is France and especially the restaurants in Bergerac and the vicinity. Similar to the other wineries in the area, they sell their wines to Northern Europe, mainly Belgium, Holland and the United Kingdom. While we are there cases of wine are being loaded on a large truck for delivery to Belgium. 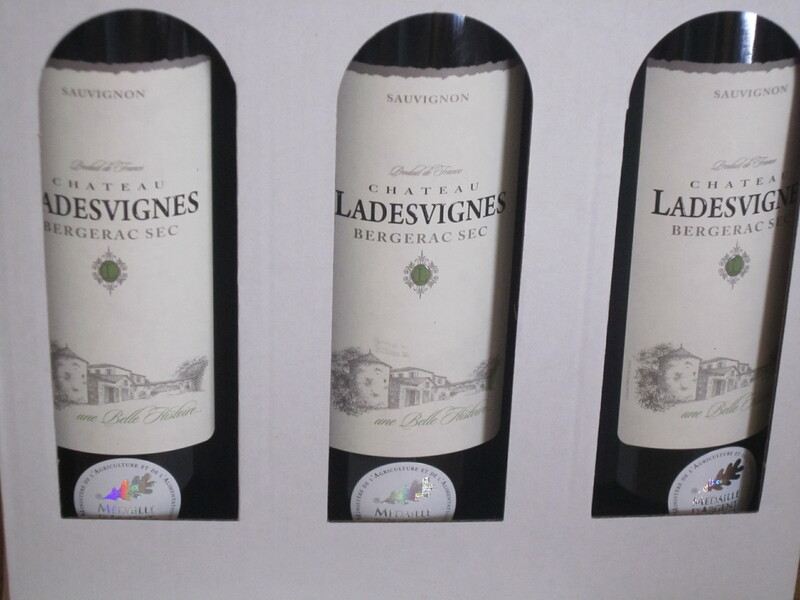 Chateau Ladesvignes is represented in Québec where their award winning Monbazillac dessert wine is available. Chateau Ladesvignes is a perfect place to visit if touring the Bergerac area. It is easy to locate off the main road to Marmande. 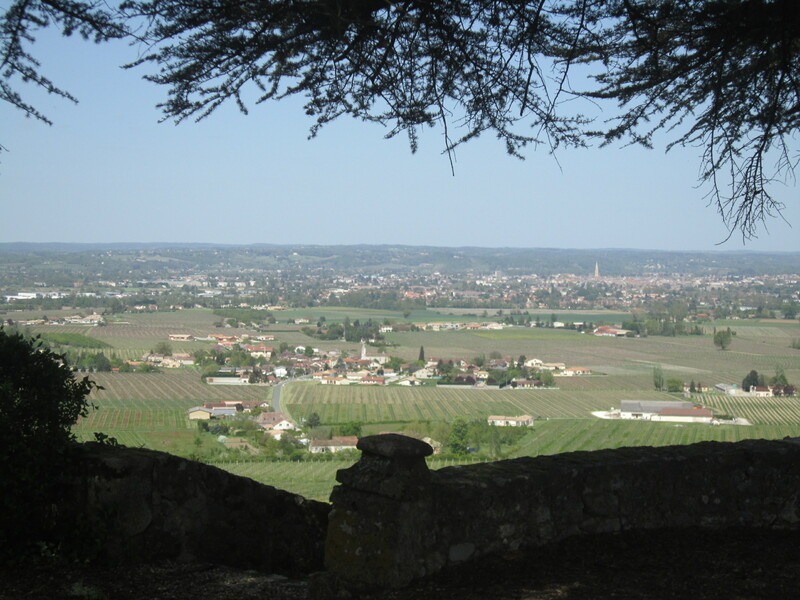 In addition to the quality of the wines and the tasting experience, there is the added bonus of the panoramic view of Bergerac and the Dordogne Valley from the shade of the grand old cedar tree. This entry was posted in French Wines, wine and food, wine tasting and tagged Bergerac wine region, Chateau Ladesvignes, Dordogne Valley tourism, French wine tourism, French Wines, South West France, wine tasting notes by elizabethsvines. Bookmark the permalink.